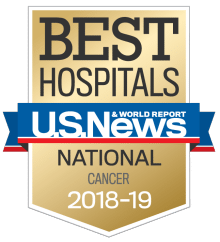 Patients at UCHealth Cancer Care – Anschutz Medical Campus in metro Denver gain the benefit of groundbreaking research and clinical trials from the University of Colorado Cancer Center, the state’s only NCI-designated Comprehensive Cancer Center – and one of only 48 in the nation. Patients consult with a cancer specialist at the CU Cancer Center in Aurora, Colorado. The University of Colorado Cancer Center in metro Denver is one of only 48 NCI-designated Comprehensive Cancer Centers in the nation and is the only such center within the state. What does this mean? It means UCHealth patients gain the benefit of groundbreaking research and clinical trials and providing access to those trials to all of the communities we serve. And, of course, it means they get exemplary patient care. Our 5-year cancer outcomes far outpace state averages as well as those of many other cancer centers in the U.S.
Live in a community far from Denver? We’re bringing access to quality cancer care to Coloradans in other parts of the state. Learn about our Community Engagement program. As a leading cancer research and clinical facility, we treat a broad array of cancer types. Learn how we can help. Call us at 720-848-0300 today. At the CU Cancer Center, you will find options for diagnosis, treatment and support – both during and after care – not available anywhere else in Colorado. We are committed to providing world-class care and service for our patients. Our doctors are highly trained in the treatment of specific cancer types using the latest technology and therapies. We provide a multidisciplinary team approach to care. That means we make it easy for you to access multidisciplinary clinical teams, including surgeons, oncologists, pathologists, radiologists, nurses, social workers, geneticists and counselors at one location and in one visit. Our experts are known for excellence in cancer diagnosis and staging – the first steps for getting proper cancer care. Basic research at the CU Cancer Center is led by a strong group of senior investigators with international reputations and extensive federal grant support. Our basic scientists strive to better understand the fundamental cell activity that leads to cancer. They work closely with our clinical researchers to translate laboratory findings into drugs, therapies and techniques that can be applied to people. Our clinical researchers then enroll patients in clinical trials to test these new treatments in cancer research studies. The result of this collaboration is a host of promising new techniques to diagnose, treat and prevent cancer. An exercise program for cancer patients. >> Visit the website for our BfitBwell program. If you’re looking for treatment for childhood cancers and blood disorders, please visit Children’s Hospital Colorado. Children’s Center for Cancer and Blood Disorders is affiliated with us, and it is considered to be one of the top pediatric cancer programs in the United States.